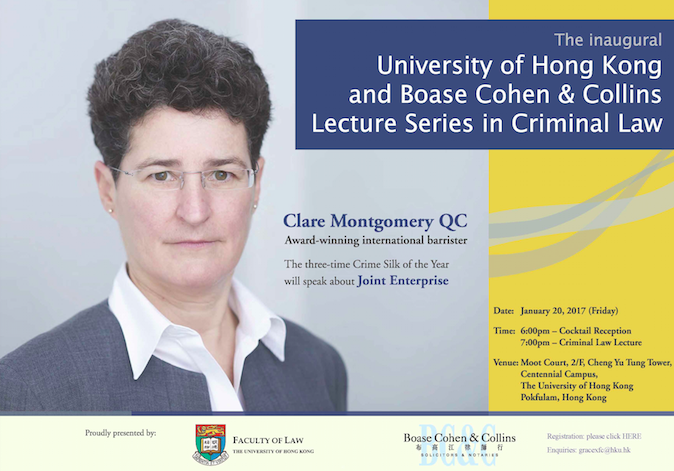 The Faculty of Law at The University of Hong Kong is delighted to announce the inaugural HKU-Boase Cohen & Collins Lecture Series in Criminal Law was delivered by award-winning international barrister Clare Montgomery QC on Friday, 20 January 2017, at the HKU’s Centennial Campus. Ms. Montgomery, of Matrix Chambers in London, is a barrister of international renown and, among the many accolades that have come her way, she has twice been named Crime Silk of the Year in the Chambers & Partners Bar Awards as well as Crime Silk of the Year in the inaugural Legal 500 Awards. She spoke about “Joint Enterprise” – a topic which has been in the news due to a landmark ruling by the UK’s Supreme Court and Privy Council in early 2016 and its historic connection with Hong Kong. She commented on the Court of Final Appeal's December 2016 decision in HKSAR v Chan Kam Shing, which decided not to follow the UK's landmark ruling. Her lecture can be viewed below. Stop deleting comments! You know that this article is too important to be ignored!